Helford River Children’s Sailing Trust has been awarded substantial funding from the Coastal Communities Fund and the European Agricultural Fund for Rural Development, enabling work to begin on its exciting project to transform 26 acres of disused quarry at Trevassack on The Lizard into a National Centre of Excellence for Watersports for ALL, opening in Spring 2021. 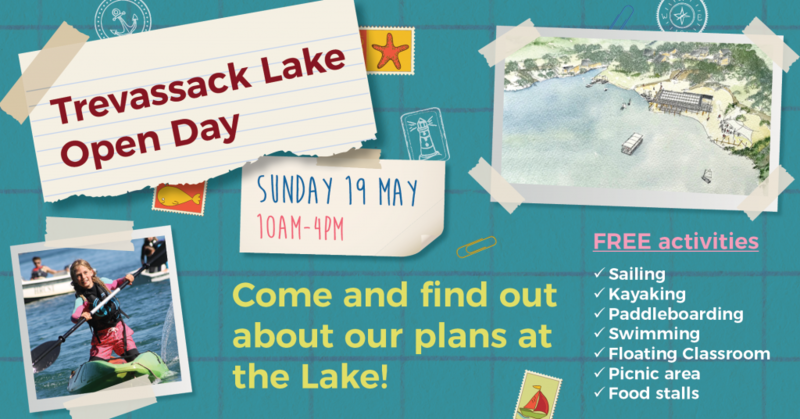 HRCST is holding a public Open Day at Trevassack Lake on Sunday 19 May from 10am-4pm with FREE activities and the opportunity to find out more about our plans. The FREE activities on offer will be kayaking, paddleboarding and accompanied sailing on the lake with our RYA-qualified Sailing Instructors. There’ll be a designated area for swimming too. The Trust will also provide sailing trips on adapted Hansa sailing dinghies and sit-on-top kayaks which will launch from a newly installed pontoon. If you would like to take part in activities and have additional needs, please contact us in advance on 07555 785102 or email using the Contact Us option below so we can discuss your requirements. Anyone attending will also be able to try out our brand-new, wheelchair-accessible Floating Classroom, which is generously supported by the Mark Benevolent Fund. The Floating Classroom holds groups of up to 15 people, including 3 wheelchair users and will be used for outdoor learning on the lake. Helford Hog Roasts will be catering on the day with all income raised going to HRCST. Off Road Coffee will be selling hot drinks and cakes. You can also bring a picnic. HRCST will provide buoyancy aids for all watersports activities but please bring a wetsuit or old clothes and a waterproof jacket. Car parking onsite and overspill parking arrangements will be in place on the day. Access to the lakeside is via a single-track road. If you have mobility issues and would prefer to arrange a drop-off at the lakeside, please contact us on 07555 785102 or email using the Contact Us option below. Trevassack Lake is just south of Garras, off the St Keverne road (B3293) and the postcode is TR12 6LH.